Bryan Hamilton has vivid memories of the night in November, 1973, when he felt genuinely scared on the football pitch. He and his Ipswich Town team-mates had pitched up at the Stadio Olimpico, Rome, for the second leg of their UEFA Cup second round tie with Lazio four goals up from the first leg. Not only had they beaten the Serie A champions elect 4-0 at Portman Road, they had done so after knocking out Real Madrid in the previous round. Bobby Robson’s men were serious European contenders and they arrived in the ancient capital in confident mood. However, when in Rome, they came across the hell-raising team of a generation, fighting for their lives in their own backyard. The game turned ugly just minutes after kick-off and it descended into farce when the Olimpico crowd invaded the pitch at the final whistle to vent their frustration at anyone they could lay their hands on. Among the baying Lazio horde that night was the ultimate bad boy of Seventies football – the late Giorgio Chinaglia. The centre-forward and talisman of the biancocelesti that Scudetto-winning season admitted, in an interview with me just two years before his death from a heart attack earlier this year, that it was not exactly the proudest night in Lazio’s history. “Yeah, we had a lot of problems. In fact we didn’t play in the European Cup after winning the Scudetto because of that night,” he began, as he turned his mind back to the 4-2 victory that wasn’t enough for his team. “We lost 4-0 at Ipswich and we said we could beat them 5 or 6-0 at home, which we were doing – it was 2-0 after 20 minutes, then I took a shot and a guy on the line parried it out with his hand but the referee didn’t give us a penalty. A matter-of-fact summary of a night that got out of hand, then. But, for the Ipswich players who were seriously affected by what they experienced in the Olimpico that night, the supposed injustices the Lazio players had made so much of didn’t feel so clear-cut. “Well Chinaglia was a fantastic player, but I’m not sure I remember it the same way as he did,” laughs Hamilton, who remembers the big Lazio No. 9 for the tackle that nearly snapped him in two as he tried to play a pass back to his goalkeeper, Dave Best. No, for Hamilton there was an atmosphere of intimidation from the word go, as he explains. “We won the game at Portman Road against Lazio and we were going out on the trip to Rome thinking that we should win the match and it will be a formality. “But the whole situation was hyped up out of sight, at some stage, somewhere. In my mind, it was from the moment we came off the plane, but there was a turning point at one of our training sessions in Italy. 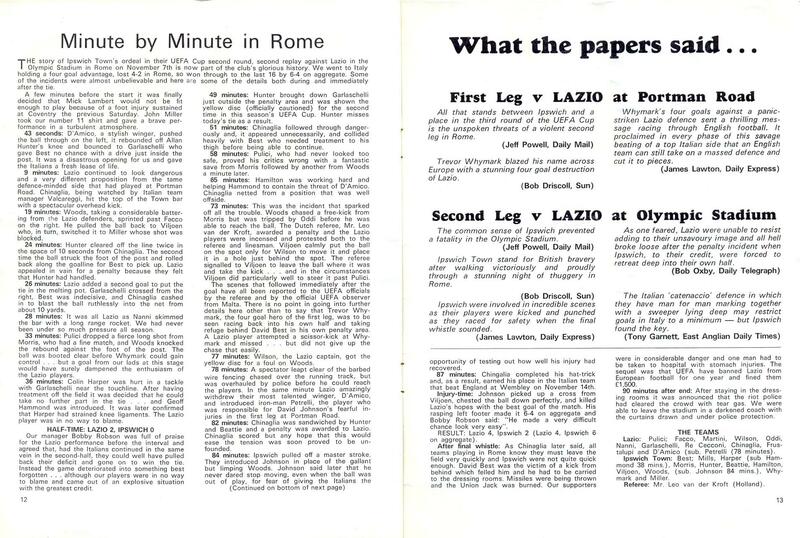 “A group of men came with a trophy for Trevor Whymark and we wondered what all this was about, but it was actually a Roma supporters club! They were so pleased that we had scored four goals against Lazio and pleased with Trevor especially. “So this was all in the build-up and even then we thought we were going to be well protected in the stadium. But from the very start of the game, the first ball was played up to Trevor and he got a smack in the back of the head and that set the standard for the rest of the game. As he continues with his recollections, Hamilton also sheds some more light on the penalty incident that Chinaglia blames for the ensuing crowd trouble. “They were two-up and I will always remember what happened next. We got a penalty kick and we thought if it went in, we’d be all right. “Colin Viljoen converted it and 10 of us just got back into our half but poor old Trevor Whymark made the decision to cheer. About four or five of their players started chasing him and he ended up behind David Best, our goalkeeper! There was an intimidation factor surrounding the whole game and I couldn’t say I enjoyed it. It was a magnificent stadium, a wonderful event, we lost the game 4-2, which meant we went through 6-4 on aggregate, but I couldn’t say I enjoyed it. “I remember David Johnson, for whatever reason, had become a marked guy. He was on the bench in Rome and, I can’t remember who said it, but I heard they were all sitting on the bench – and we were all very decent, sensible players – and someone apparently ran past and spat on him! Unfortunately, after the intimidation and the hanging threat of something worse to come, the Ipswich players’ fears were realised as the final whistle blew and they raced back to their dressing room, fleeing the home supporters who had rushed the pitch in anger. They would be cooped up in there for another two hours while the police calmed the raging storm outside. Hamilton admits he has no idea what happened – he simply ran to the dressing room and emerged, dazed and confused, into a fog of fading tear gas hours later when it was safe to unbolt the door. Chinaglia, on the other hand, remembered what was happening on the other side of that locked door. Asked if any of his team-mates had been among the masses banging on the Ipswich dressing room door, Chinaglia was a little less forthcoming. As for Hamilton, he may have been glad to get out of Rome that night, but he hasn’t let the experience tarnish his view of the Eternal City. “I’ve since been back to Rome and I love it. I took my wife there for her birthday and it was wonderful, it’s a beautiful city and I’m glad I went there again to see that. “Even at the time of the game, Bobby Robson took us for a tour of Rome before the game and we saw the sites. I remember sitting with Alan Hunter in the Vatican and being unbelievably impressed, but the whole football match had tarnished it all. Lazio: Pulici, Facco, Martini, Wilson, Oddi, Nanni (D’Amico 61), Garlaschelli (Manservisi 61), Re Cecconi, Chinaglia, Frustalupi, Petrelli. Ipswich: Best, Mills, Harper (Hammond 42), Morris, Hunter, Beattie, Hamilton, Viljoen, Woods (Johnson 83), Whymark, Miller. Ipswich Town progressed to the quarter-final stage of the UEFA Cup, beating FC Twente in the third round before losing to Lokomotiv Leipzig of East Germany on penalties after both legs finished 1-0 to the home sides. In 1981, Bobby Robson’s did lift the UEFA Cup, however, defeating AZ of Holland in the Final. It was a golden age for Ipswich, who also won the FA Cup in 1978. By that stage, however, Bryan Hamilton had moved on from the club, joining Everton in 1976. Despite that ill-tempered defeat to Ipswich, Lazio went on to win their first-ever Scudetto in 1973/74, finishing two points ahead of Juventus. Giorgio Chinaglia finished the campaign as Serie A top scorer with 24 goals. However, the club was banned from competing in Europe due to the events that night in the Stadio Olimpico and could not compete in the European Cup as Italian champions the following season. Chinaglia eventually left the club in 1976 and made the surprising move to the United States at the age of 29, joining Pele at the New York Cosmos. He became the highest goalscorer in the history of the North American Soccer League. He died following a heart attack in April this year and the outpouring of grief at Lazio’s home game against Napoli a week later demonstrated the hero status Giorgio attained with the biancocelesti tifosi.